When I first thought about how to I could describe Tooth and Claw in a way that truly conveyed its level of awesomeness, I could only think of: “it’s a Jane Austenesque novel with Dragons. Cannibal Dragons”. On second thought though, although that line does more or less captures the gist of it, it is not quite right. Tooth and Claw is, after all, more Victorian than Regency. Eating each other is at the centre of this society – it’s what dragons fear the most, and what they most look forward to. Dragon meat is not only delicious but so nutritious as to make whoever digests it literally bigger. The bigger the dragon, the stronger it is and the more important in the grander social scheme of things. But of course, only dragons who are already significant (in terms of their size and in their social standing) manage to eat other dragons. It’s a vicious circle that seems impossible to break. The “why” is also important: weaklings, sickly and older dragons are eaten so that the race can be bettered (and so that other dragons have enough dragon meat to go on) and dead dragon’s meat is divided between the members of their families according to a Will that stipulates the amount that each family member will devour or depending on – again – social standing. The novel opens with Bon Agornin’s on his deathbed and his devastated family getting ready to eat his remains. There is the matter of an expressed Will in which the bulk of his remains is to be divided between his three youngest children Avan (who lives and works in the city), Selendra and Haner (both young maidens). But his expressed wishes are contested by his ambitious son-in-law, who wins the argument and takes a greater portion. The three younger dragons – who have already lost their father, their home and who have little gold to their name –are now unable to even grow on their expected inheritance. This precipitates one of the main arcs in the book, as Avan decides to sue his brother-in-law. And that’s what makes Tooth and Claw a delight: it is about bloody dragons, who might eat each other but please, let’s all be proper about it, and follow the rules and wear the right hats (ha, dragons wearing hats). Because propriety and order rule this world, and the social structure of their society is set in stone and hardly questioned. There is extreme importance given to being a maiden and women’s lives can be ruined in one single moment. Those in service have no expectations other than remain in service until they die (or get eaten) and those who are male and rich can basically get away with anything. And in a way, it is all very familiar except for how far the author takes those. So a maiden is no longer a maiden when she blushes: a mere touch by a non-family member will do it and her new pink colour is a sign for all to see. The dragons who work in service cannot fly, their wings bound, their movements restricted. Tooth and Claw is a novel where the word literally has a whole new meaning (figuratively, speaking of course). It is a very interesting exploration of familiar themes of gender and class oppression in a way that makes that oppression literally visible (although not necessarily more real). It is not all seriousness, blood and guts though, for Tooth and Claw is also a comedy of manners! With a delightful omniscient narrator and a focus on the three youngest Agornins and their lives. Avan who is a nice chap who shares his life with a young female dragon who is not a maiden making their association a complicated thing. Selendra and Haner are both in the marriage market, each learning to stand on their own feet after being separated into very two different households. There is a clear divide between the structured, inflexible older generation and this new generation full of forward-thinking ideas. And there is even – yes, I think I shall use the word – swoonworthy romance and awesome relationships. And this is where the novel is at its most Jane Austenesque as Selendra and Haner have a little bit of all Jane Austen heroines in them. Plus, there is a male dragon called Sher that ….I shall say no more, dear reader. Some delights are better experienced without advance notice. Tooth and Claw is as close to perfect a book can be. I loved it. I am at a loss when it comes to attempting to describe Tooth and Claw. 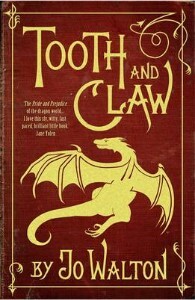 Allow me take Ana’s words, to emphasize the awesome: Tooth and Claw is absolutely Jane Austen-esque, but with dragons. Take the social mores, the gender roles and restrictions, the foibles of Austen’s work, but blend that with cannibalistic dragons with their own laws of propriety and social strata – then and only then will you get even a close approximation to Tooth and Claw. For me, the strongest and most compelling part of the novel (the first I’ve had the pleasure of reading from Jo Walton) is its worldbuilding. This is a world strikingly similar to Regency England (well, yaknow, if society comprised dragons exclusively) – there are lords and ladies, daughters who must rely on their dowries in order to make a good match and thrive in society. There are servants and pastors and those born into money and status, just as there are those who must fight tooth and claw (oho!) for their way in the world. But, unlike Regency England, in this society, weakness – green colored dragons, small dragons, ailing little children, or the elderly, or the oppressed – equates to instant death. Those dragons deemed too weak to live will be killed and immediately eaten by others, their lifeforce fueling the dining dragon’s size and power. Oh, yes, there is magic too, for these are talking dragons and flying dragons. And for all that they are civilized creatures with a hierarchical society mimics an oft romanticized period in human history, they are also dragons. They dine on raw flesh and on each other, adding a level of frightening alien-ness to this particular world. The most fascinating aspect of the particular world, to me? The “blush” of dragon females when they are leaned on by male dragons – it’s a terrifying and fascinating physical manifestation of “impure” females that examines agency and choice in such a smart, brilliant way through these female dragons. When Selendra is accosted by the amorous advances of an old family friend who professes his love for Selendra and intends to make her his bride, she turns from maiden gold to bridal pink – to her great horror, for she refuses his advances. To society, a pink dragon is one that has accepted the embrace of a male, and if not affianced, such a dragoness is ruined (and likely eaten later). In many ways, Tooth and Claw is a kind of explication of our own world, a hyperbolic reflection of the flaws in our history and society. The concept of absurd creatures exposing the flaws is a familiar one (see Amberville, or any number of robot/zombie/vampire type fiction), Walton’s choice of dragons is, frankly, unparalleled. I cannot think of a book that does it better. My only criticism of the novel is how leisurely and meandering it is – and this is not exactly a bad thing. Not every book needs to be a white-knuckle thrill ride, and Tooth and Claw is definitely more of a beautiful scenic tour than a roller coaster. I loved the characters, and I loved the story of their lives that unfolds following their esteemed father’s death. I only wish there was more of a force driving the novel forward. As Ana and I discussed when thinking about this book, my only issue with Tooth and Claw can be boiled down to the same reason I *love* Jane Austen’s books so much: the heroines. I love the heroines in Austen’s work – from Lizzie to Emma to Anne to Marianne and Elinor. Tooth and Claw is very much in the spirit of Marianne and Elinor Dashwood (both of whom I love dearly)… but while sisters Selendra and Hanner (and Berend! Who actually was my favorite of the sisters) are wonderful characters, I didn’t fall in love with them the same way that I root wholeheartedly for an Austin heroine. If that makes any sense at all. Ultimately, Tooth and Claw is a brilliant, beautiful book. I loved it and highly recommend it – and I cannot wait to read more from Jo Walton very, very soon. I thought that you two would like it! I’m doing my undergrad in Anthropology and Sociology, so I love really good world-building in fantasy. I was especially tickled by the way that Victorian mores were explained physiologically in dragons. Jane Austen with dragons? I have to get this. Lifelode is utterly wonderful. I also recommend The Prize in the Game, which is her retelling of the cattle raid of Cooley, and has lush, intense plotting, and some of my very favorite characters, both male and female. It’s available online free, I think, if you dig around. “it’s a Jane Austenesque novel with Dragons. Cannibal Dragons”. I must read this book. It sounds so unique but still grounded. I can’t wait to explore this world and learn about the dragons’ mores and customs. It has immediately moved up in my must read list. It’s finding books like this that makes me love OSW so much. I’ve also heard it described as Trollope with dragons. While I haven’t myself read any Trollope, I think that captures the Victorian flavor. Katrina, I really liked Lifelode, though I thought the end got a bit…mmm…unwieldy? It’s also modeled on the structure of one of my favorite books, China Court by Rumer Godden, so I was predisposed to like it. Thanks for the excellent review. Must agree with Paige, the Prize in the Game is an utterly brilliant read. 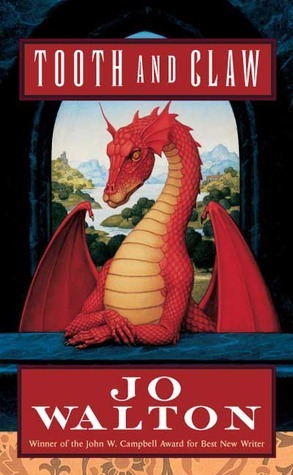 While at first I was loving this novel and then I ran across some logic issues with the size of the dragons and the size of where they lived and that broke down the whole concept for me. I might try again because that was many years ago and perhaps I was just being overly critical. Did anyone else have trouble with that issue or was it just me?